Love Sheraton and my husband was a front of the house manager in Steamboat for years...loved all about the hotel except that there was no coffee in the room—they actually wanted us to pay for coffee and tea in the restaurant—absolutely appalling for a hotel at this price. Even comfort inn cheapo hotel has complimentary coffee. My wife and I stayed at the Sheraton Denver West for a single night. The hotel is very nice and the hotel staff and welcoming. The room was clean and very comfortable. The second bed's sheet had a black smudge on the corner. Always impressive! Overall great experiences every time. We were without power up at our place in the mountains due to the recent snowstorm and needed a place for the night. Needed a close hotel that was pet friendly with reasonable fee. The Sheraton offered both clean, comfortable affordable room and reasonable pet friendly atmosphere and fees that was close to home. Highly recommend it. Comfortable hotel. Everything was nice, except for the very lumpy bed! When I told the receptionist about the bed, she said that it will be fixed right away. Great service! Room was dirty and the hot tub was not very hot. I have no intention of staying at this hotel again. I was there on business. Everyone was nice, and the room was clean and comfortable. It was conveniently close to Denvers light rail system, so no rental was necessary. Great staff and service, specially the restaurant. It was a great time... quiet...YES!!!!! The pillows were SO great!!!..... we were comfortable from the moment we arrived.... we left feeling so relaxed... the hotel sure pampered us!!! Very clean and comfortable. I had a great view of the mountains. No complaints at all. 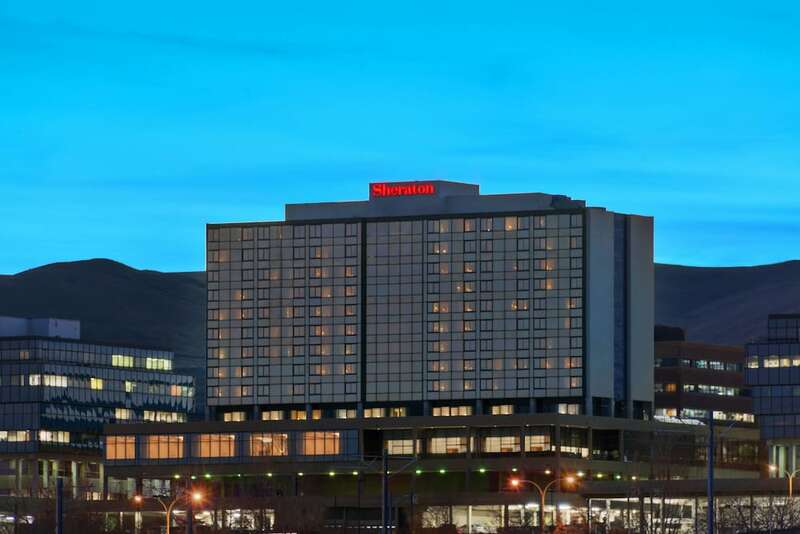 Sheraton Denver West Hotel places you within a few miles (5 km) of Denver Federal Center and Colorado Mills Mall. This 242-room, 3.5-star hotel welcomes guests with a restaurant, an indoor pool, and a 24-hour fitness center. Enjoy a bite to eat at the hotel's restaurant, or relax with a drink at the bar/lounge. Savor a meal from the comfort of your room with room service. Start each morning with full breakfast, available for a fee from 6 AM to 10:30 AM. Guests can expect to find free WiFi and 32-inch an LCD TV with digital channels and pay movies. Pillowtop beds sport premium bedding and the bathroom offers a hair dryer and free toiletries. Other standard amenities include a coffee maker, free weekday newspapers, and free bottled water. At Sheraton Denver West Hotel, guests enjoy features like an indoor pool, a 24-hour fitness center, and free WiFi in public areas. There's free parking and a free area shuttle. The front desk has multilingual staff on hand 24/7 to help with dry cleaning/laundry, securing valuables, and concierge services. Other amenities at this ski hotel include conference space, a business center, and express check-out. Thank you for your review. We look forward to seeing you again soon! Thank you for your feedback. We regret that we were unable to meet your expectations during your recent stay. We invite you to come back in the future so we may make amends. Thank you for choosing Sheraton. Josh, Thank you for your feedback! We are glad you enjoyed your stay and we look forward to serving you in the future! Thank you for staying with us. We appreciate your feedback! Thank you for staying with us. We appreciate your feedback! We look forward to your future stays with us! Valued guest, thank you for sharing such positive feedback about your stay at the Sheraton Denver West. We appreciate your comments and hope to serve you again soon. Full breakfast is served daily from 6 AM to 10:30 AM for a fee. La Cave - Restaurant and bar serving breakfast, lunch, and dinner. Recreation features at Sheraton Denver West Hotel include an indoor pool and a 24-hour fitness center. The preferred airport is Denver, CO (DEN-Denver Intl.). The front desk is open 24 hours a day, and checking out is easy with express services. Driving? This property offers free self parking, along with RV, bus, and truck parking.